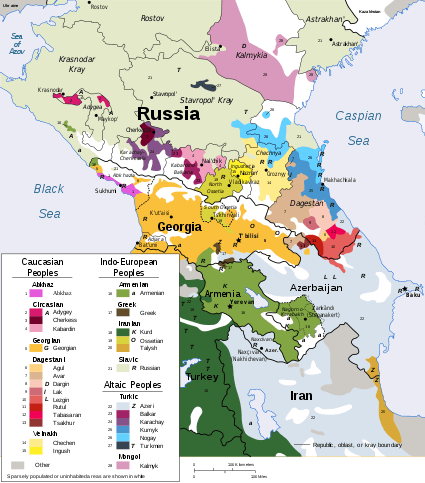 The Svan language (Svan: ლუშნუ ნინ lušnu nin; Georgian: სვანური ენა svanuri ena) is a Kartvelian language spoken in the western Georgian region of Svaneti primarily by the Svan people. With its speakers variously estimated to be between 30,000 and 80,000, the UNESCO designates Svan as a "definitely endangered language". Like all languages of the Kartvelian family, Svan has a large number of consonants. It has agreement between subject and object, and a split-ergative morphosyntactic system. Verbs are marked for aspect, evidentiality and "version". Svan retains the voiceless aspirated uvular plosive, /qʰ/, and the glides /w/ and /j/. It has a larger vowel inventory than Georgian; the Upper Bal dialect of Svan has the most vowels of any Kartvelian language, having both long and short versions of /a ɛ i ɔ u æ ø y/ plus /ə eː/, a total of 18 vowels (Georgian, by contrast, has just five). Its morphology is less regular than that of the other three sister languages, and there are notable differences in verbal inflections. Svan is the native language of fewer than 30,000 Svans (15,000 of whom are Upper Svan dialect speakers and 12,000 are Lower Svan), living in the mountains of Svaneti, i.e. 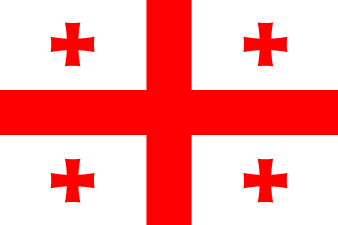 in the districts of Mestia and Lentekhi of Georgia, along the Enguri, Tskhenistskali and Kodori rivers. 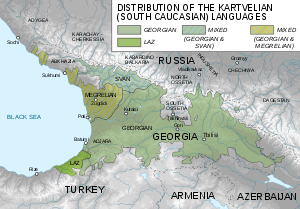 Some Svan speakers live in the Kodori Valley of the de facto independent republic of Abkhazia. Although conditions there make it difficult to reliably establish their numbers, there are only an estimated 2,500 Svan individuals living there. The language is used in familiar and casual social communication. It has no written standard or official status. Most speakers also speak Georgian, the country's official language, and use it as their literary and business language. There is no official instruction in Svan, and the number of speakers is declining due to the dispersal of the Svan population in the face of increasing economic hardship. The language is regarded as being endangered, as proficiency in it among young people is limited. Upper Bal: Ushguli, Kala, Ipar, Mulakh, Mestia, Lenzer, Latal. Lower Bal: Becho, Tskhumar, Etser, Par, Chubekh, Lakham. Apart from the odd /eː/, only Upper Bal and Lashkh dialects have long vowels. Only Upper Bal has /æ, æː/; Lashkh does not have the front rounded vowels /œ, œː, y, yː/. are used in the Lower Bal and Lentekh dialects, and occasionally in Upper Bal; these sounds do not occur in Lashkh dialect. ↑ Hammarström, Harald; Forkel, Robert; Haspelmath, Martin; Bank, Sebastian, eds. (2016). "Svan". Glottolog 2.7. Jena: Max Planck Institute for the Science of Human History. Kevin Tuite, Svan. Université de Montréal. ISBN 3-89586-154-5. ECLING - Svan (includes audio/video samples).